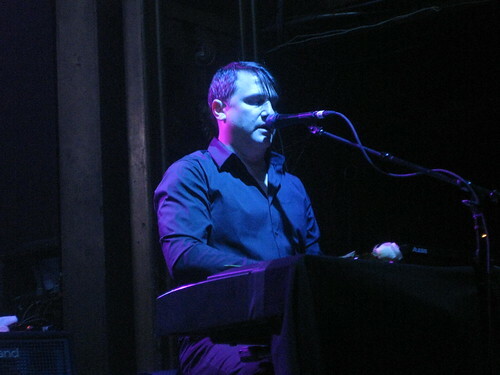 One of the things I have always loved and appreciated about Greg Dulli is that he’s not ashamed to be a frontman. The word “showmanship” isn’t anathema to him. When he is on stage, he is ON STAGE. So on a night when he’s filming the show for what I can only assume is commercial release, he’s going to turn it all the way up, hard. I’ve seen him do this with the Afghan Whigs, I’ve seen him do it with the Twilight Singers – even on the solo tour or with Lanegan on the Gutter Twins tour, Dulli is a like a magician the way he can grab the energy, flip it around, find it if it’s hiding, beg for it if he has to, demand it if it’s not meeting his needs, cajole it out from a shy crowd. It was clear from the minute the band walked onto the stage that their energy was off the charts. The first four songs – “Last Night In Town,” “Blackbird and the Fox,” “I’m Ready” and “Forty Dollars” felt like you were being steamrolled. The sound was perfect. The band was tight. The energy was just absolutely insane. I’ve seen a freakish amount of Dulli project shows and this has to be in my top five. I don’t mean to insult other performances, because I’ve never seen Greg phone it in, but last night was just something other. Everyone was in a great mood. Dulli smiled the entire time – hell, everyone smiled the entire time. The band is – I would say ‘just short of perfect’ but they’re perfect for Greg. Dave Roesser is a guitar wizard, Scott Ford was reminding me of Entwistle last night with his solidness and fluidity, and Greg Wieczorec on drums is absolutely what Dulli needs. He’s an amazingly physical drummer, but incredibly focused. And then he came barreling back into the song, which was the uncontested highlight of the night. (Also in that running: “Candy Cane Crawl,” the best I’ve ever seen it, and “King Only” which rarely impacts me at all.) It felt like 12 people in the entire venue knew the song, which is deplorable, but not surprising, I guess: gone are the days that Greg can talk Ted Nugent and find a dozen guys who grew up listening to the same stuff he did. Another highlight of the night was the visual backdrop, cycling through a series of photographs that whoever mans the @twilitekid account on Twitter posts every couple of days. It definitely added to the performance without becoming a distraction; the shot of Jerry Lee Lewis with his 13-year-old wife told me what the next song was before Dulli’s hands touched the keys for “The Killer”. At the end of the night, as the final chords of “Esta Noche” rang out, Greg put down his guitar, faced the audience, and raised both arms in the air, his smile enormous and finally, relaxed. He didn’t need our applause to know he’d knocked this one out of the park this time, but he soaked in the applause for a second or two before leaving the stage, letting the band play him off. My friend Lorin sent me your blog today to help his cause in our ongoing debate about if Greg Dulli is still on top of his game. I wish I felt the same as you do in the above. As an avid Whigs fan, I’ve seen Greg perform all over the states, as well as countless times in my hometown, Detroit. I read your blog and thought about how lucky you are to have seen the man I once adored continue to be passionate and moving. The last time I saw him was here in the D last year, and I was so disappointed that I left early. Greg seemed tired, tired from a long life of touring and boozing. The energy was almost non-existent, and he didn’t smile once (hell, he really didn’t even look at the audience). I thought to myself “my time with him has passed”. I envy you. I would kill to see just one more time the passionate, irresistible swagger Greg used to serve his audience, and what used to make me tingle with excitement and awe. Bummer. NYC brings out the best in Dulli. Saw thePhilly show on Tuesday and the NYC show Friday. Though I had to leave the NYC show during “on the corner” (wife was wasted), there was more enthusiasm. Don’t get me wrong, Philly was great but NYC was just that much better. Can anyone tell me what the encores were? Este Noche was one. Wish I could have stayed but had to take care and get back to jersey. Dulli rocksand always will. Just like the Stones. Paint it black paint it black you devil! anybody have a setlist for this show? Nothing more annoying than people who post nothing on a show review than a demand for a setlist. Especially when it’s posted by the Twilight Singers after every show, and there are links on Facebook and a Google search of “Twilight Singers setlist” gets you something worthwhile AND I have a photo of it in my flickr feed. damned people don’t even bother to try to look. clr — I’ve actually been searching on google for several days trying to find a setlist, and I haven’t been able to find anything apart from this article yet. So, this damned person actually has bothered trying to look, but to no avail yet. I actually enjoyed reading your detailed write-up, and I’m glad I found it. I was hoping to find something with just a setlist, but your thoughts on the show are much fuller and give a better sense of the show that I unfortunately missed. Perhaps in the future, you might consider including a full setlist at the bottom of your reviews for your readers — just a suggestion. If I could offer another suggestion, you might also consider being a bit more hospitable to your readers. I can see how a one-line post asking for a setlist is probably annoying for you, though that’s certainly not what I intended. But again, just a suggestion and something that’d be up to you. All the same – thanks for the write-up and pointing me to those other sites. I wasn’t aware about TS posting setlists after each show, facebook, etc. To no avail? I just told you two confirmed places to find it! There is a picture of the setlist. Taken from the stage of the actual show in my Flickr feed!